Continuing our series about companies that appear to run by monkeys is… AOL. The Internet dinosaur has been trying hard to survive in the Web 2.0 era and has attempted to position itself as a content destination. The company now owns a number of large content websites including MovieFone and TechCrunch. That might have been a smart move — smarter certainly than mass mailing CDs to snail mail addresses. But as I discovered recently, they still haven’t got it. Stumbling upon politicsdaily.com recently, I found an article I really liked and decided to do something I hardly ever do: add a comment. I wrote my feedback, polished it, spell-checked it and, finally, clicked on the submit button to post it. A pop-up asked me to login – irritating, but standard. What wasn’t standard was that the only option to login was through AOL! At first I thought I had to be missing something. 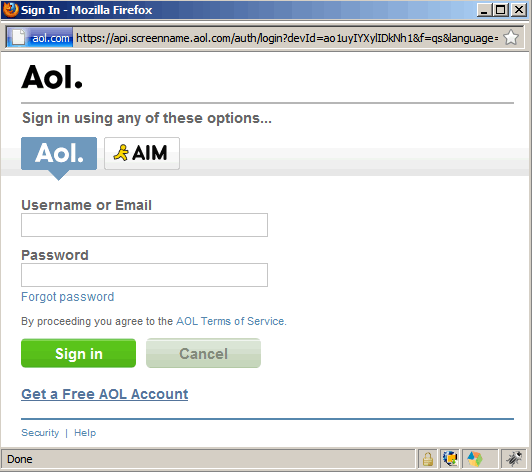 I was certain that I could login to Facebook and post, but no — the only option was to login through AOL. There, at the top of the page, was an AOL logo, making it clear that this site was an AOL property. Now it all made sense, kinda, sorta, but not really!!! If AOL’s goal is to become the Web’s #1 content provider, the company needs to put aside its enormous ego — which was made it fail in the first place — and let people login the way THEY want to login and not the way AOL wants us to login. This will encourage user participation and help AOL achieve its goal. Since I am not an AOL customer, and never will be (unless of course AOL comes up with something new and amazing), my only option was to just drop the whole commenting thing. Oh, well. The world will have to survive without my clever comment about why women who post the color of their bra or where they like to place their purse on Facebook are acting like sheep. With bras and handbags.